Click the Custom Fields command on the Tools menu. Click the "Add custom fields" or "Manage custom fields" link on the Contact, Event, Task, or Note Editor. 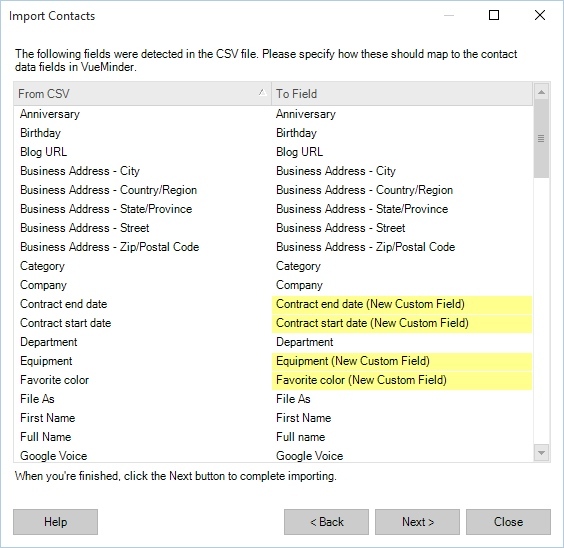 Custom data fields can be defined for contacts, events, tasks, and notes. Custom data could include things like invoice numbers, billing codes, shipment dates, patient diagnoses, etc. Custom data can be imported/exported, published/subscribed, synced with other VueMinder installations through Google Calendar, and shared over a local network. Custom fields nicely integrate with the other input fields near the top of the Contact, Event, Task, and Note Editor windows. The "Custom Fields" window enables the creation, deletion, or modification of custom fields. Custom fields are exclusive to VueMinder Ultimate. This feature is not provided in the Lite and Pro versions. However, if you've previously purchased a Pro license, you qualify for a discount on VueMinder Ultimate. You can receive the discount by clicking the "Buy VueMinder Ultimate" command on the Help menu. See the screenshot below for an example of how custom fields appear on the Contact Editor. The custom fields are nicely integrated with the rest of the input fields on the Contact Info tab. Without knowing which fields were included by default and which are custom, it would be difficult to tell by looking at the window that some of the fields were user-defined. Also, a "Manage custom fields" link is provided below the custom fields. 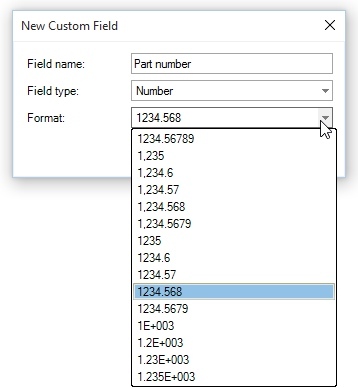 Clicking this link will open the Custom Fields window, where additional custom fields can be defined or existing custom fields deleted/modified. The Custom Fields window is accessed via the Tools menu or by clicking the "Add custom fields" or "Manage custom fields" links on any of the editor windows. The Custom Field Manager consists of tabs for each of the data types where custom fields can be defined - Events, Tasks, Notes, and Contacts. 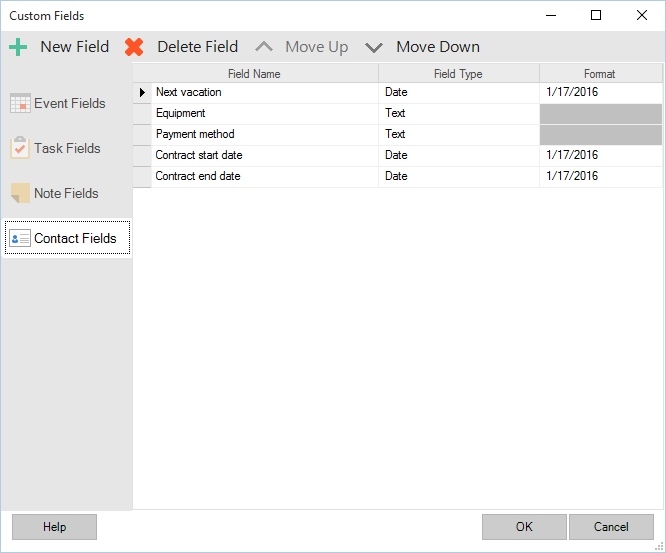 Buttons are provided at the top of the Custom Field Manager to create, delete, or re-arrange fields. The custom field list includes columns for the field name, data type, and format. The cells in these columns can be edited. For example, to change a custom field's name, type the desired name in the Field Name cell. The Format column will show an example of how the field value will be formatted, and can be changed via a drop-down selection depending on the field type. Some fields have no associated format, so the Format cell for those fields will be grayed out. To create a new field, click the "New Field" button. A "New Custom Field" window will appear where the field's name, type, and format (when applicable) can be specified. Depending on the selected field type, a "Format" drop-down will allow the display format of the field values to be modified. For example, a number field can be formatted to always show 3 digits after the decimal point. 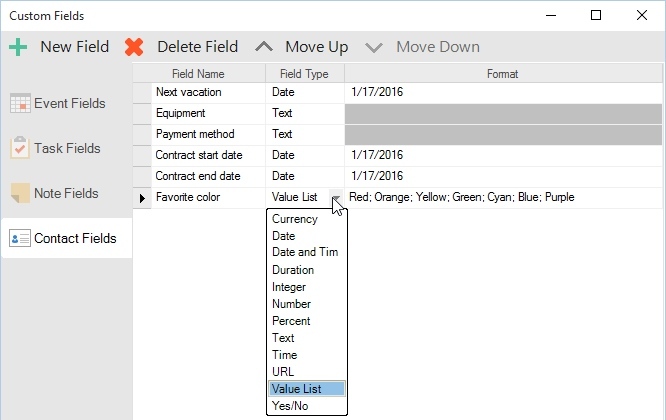 When the field type is set to "Value List", the Format field is used for entering the predefined values which will appear in a drop-down list when entering data for the custom field. The values should be separated with semi-colons. After clicking OK, the new field will be added to the custom field list on whichever tab is currently activate in the Custom Fields window. If changes need to be made to the field, the field cells can be edited. After clicking the OK button on the Custom Fields window, the changes will be committed and any open editor windows will be automatically refreshed to show the current custom fields. In the example below, the new "Favorite Color" field has been added to the Contact Editor. Clicking the drop-down arrow in the field editor will show the predefined values that were entered in the Format column. Custom fields can be deleted by selecting one or more rows and then clicking the "Delete Field" button. The changes won't be committed until the OK button is clicked. Note, if values have been previously entered for the fields that are deleted, those values will be removed as well. The "Move Up" and "Move Down" buttons can be used to control the order the fields are shown in the associated editor window. The Event, Task, and Note editors can be configured to arrange the custom fields using between 1 and 8 columns. The fields will be listed by row and then column, based on the order specified in the Custom Field window. For example, if there are 3 columns configured and 5 custom fields, the fields will be shown in 2 rows. The first row will contain the first 3 fields, in order from left to right. The second row will contain the last 2 fields, again in order from left to right. When data is shared over a local network, any custom data fields added on one computer will automatically propagate to other computers. Nothing needs to be done to enable this feature. It will happen automatically for any installations of VueMinder Ultimate that are configured via the Sharing Options to share data over the local network. Instructions for sharing data can be found here. Note, when sharing custom fields with other computers, all data except the field order will sync. 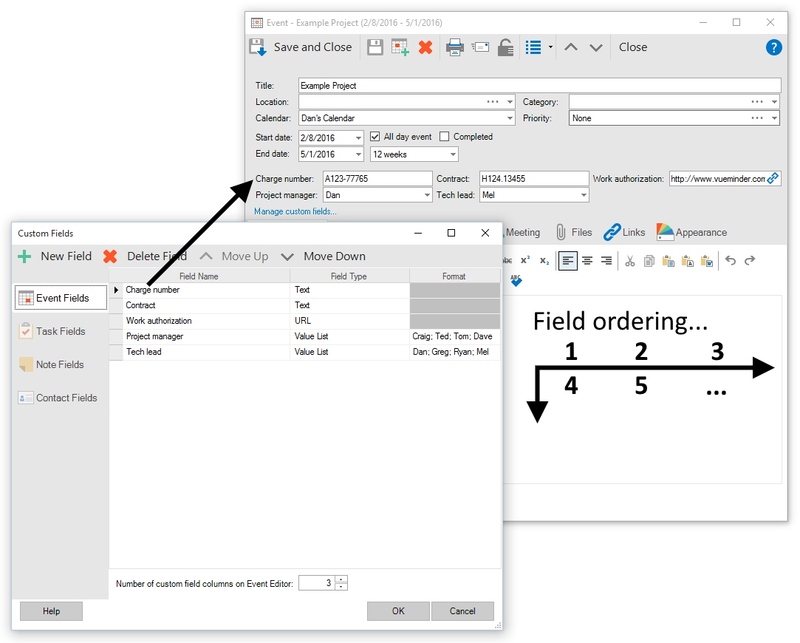 The field order is a user-preference and can be customized by each user without affecting the field order on other computers. Custom field values will be displayed in columns of the Contact, Event, Task, and Note list views. 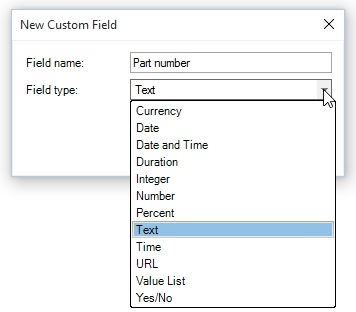 You can select which custom columns should be visible by right-clicking the column header and checking or unchecking the custom field names under the "Custom" sub-menu. 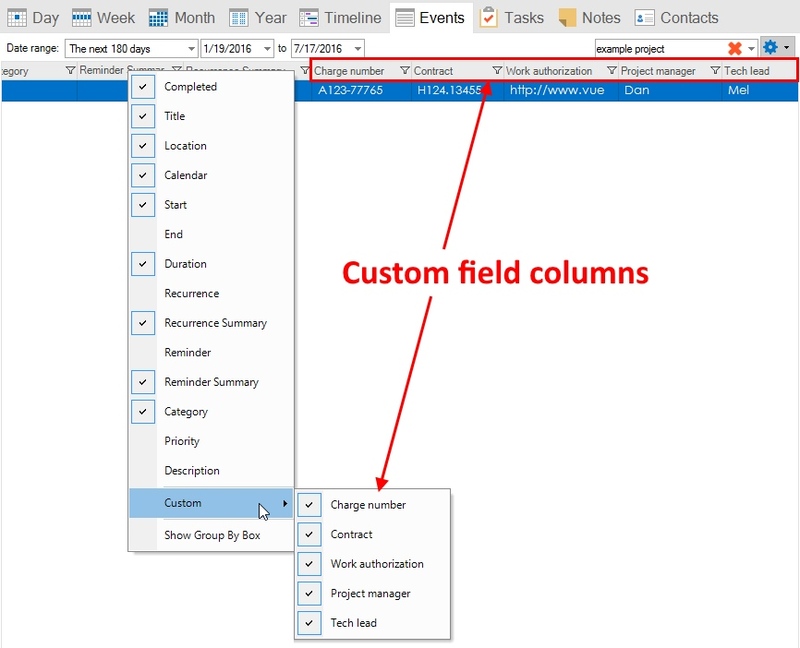 All the other column features, such as filtering, sorting, resizing, re-arranging, printing, exporting to Excel, etc., will also work with the custom field columns. When importing from Excel, CSV, or tab-delimited text files, new custom fields can be automatically created for any column names that aren't recognized or don't map to an existing field. During the import, a window will appear where the field mapping can be specified. 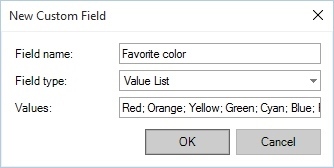 Any new fields will be highlighted in yellow, so the user can determine if a new field should be created or if the imported data should map to something else. Exporting custom fields works much the same as exporting the other data fields. For example, when exporting to Excel, custom fields will be exported as columns. When exporting to ICS, custom fields will be an extension to the file and can be imported by other users into VueMinder Ultimate. The custom fields will be ignored if importing into VueMinder Lite or Pro.